156 Squadron’s ORB observed that W/O Batman in JB302 took-off at 17.19 hrs with a bomb-load comprising – 1×4 flares red/green, 2 xT.I s green L/B, 2x T.Is green, 1 x 4000HC, 4 x 1000MC, 1 x flare steady. A similar bomb-load to 405 Squadron’s ‘blind marker illuminators’. W/O Rule’s JA702 bomb-load was 5 x 2000 HC his role was as ‘supporter’ – up 17.08 hrs. Both JB302 and JA702 were lost on this operation. An idea of how seriously these young men took their job, their attention to detail and precision comes from a familiar name – W/O Stanley Neighbour and crew in ND454 – up 17.12, dn 23.15. ‘Target was bombed from 18,500ft at 20.16.55 hrs. At 20.13.7 hrs the first R/P flares* were seen and at time of bombing about 5 R/P flares had dropped forming a close circle estimated at not more than a few hundred yds in diameter. Immediately after bombing two more R/P flares fell singly slightly to SW of main concentration. Towards end of attack R/P flares formed line E/W. Only one T I seen – a Red at 20.16 hrs. Thick cloud prevented further observations and S/Ls** were ineffective. Slight H/F, and moderate L/F. One photo attempted. Bomb-load as above’ ( 1×4 flares r/g stars, 2 xT.I g L/B, 2x T.I g, 1 x 4000HC, 4 x 1000MC, 1 x flare red steady). *R/P flares – release point flares. P/O Hopton had come to 156 Squadron on 7th November a year and a couple of days after arriving in the UK from Canada and having already flown operations with 12 Squadron at RAF Wickenby. Cecil Hopton was a twenty-five year-old married man from Montreal who listed his sporting interests as tennis, swimming, skiing, hockey, rugby, baseball, badminton, golf (moderately), he had married Dorothy Symes three weeks before embarking for Britain. 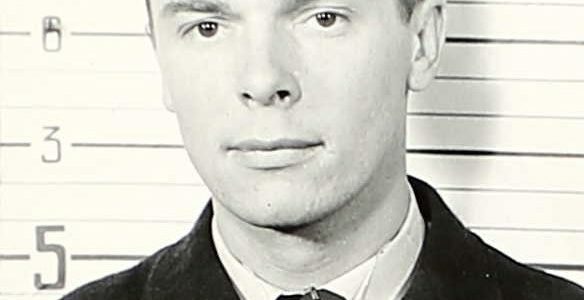 Cecil obviously did overcome his nervousness and duly graduated as a pilot undertaking his initial training in Canada, completing his training in the UK via 30OTU and 1662CU and was posted on 7th June 1943 for operational flying with 12 Squadron as a sergeant pilot. S/Ldr George Roden assessed F/Sgt Hopton for a commission at the end of September 1943 – all categories of his personal assessment were consistently good, but not excellent, and S/Ldr Roden recommended that Hopton was a ‘cheerful and well mannered NCO and has shown courage and resourcefulness in adverse conditions. Recommended for commission’. Cecil was elevated to Pilot Officer, commissioned w.e.f 11th August 1943. In all, Cecil Hopton flew operations for a year – by 7th June 1944 Hopton had been awarded the DFC and held the rank of Squadron Leader. His luck ran out on the night of 7th/8th June 1944 when Bomber Command sent 337 aircraft to attack railway communications targets at Achères, Juvisy, Massey-Palaiseau and Versailles to disrupt German troop movements immediately following the invasion. 156 Squadron was tasked to attack the Versailles railway marshalling yards Having apparently completed their sortie the bombers were on their return leg when German night-fighters intercepted ND577, at about 2.30 in the morning of the 8th June over the village of Les Mesnuls, about 15 miles west of Versailles. The attack on Versailles-Matelots rail-yards was the 28th operational sortie Hopton flew with 156 Squadron and was that night acting as deputy Master Bomber. His parents understood that he was lost on the first or second sortie of his third tour of ops. 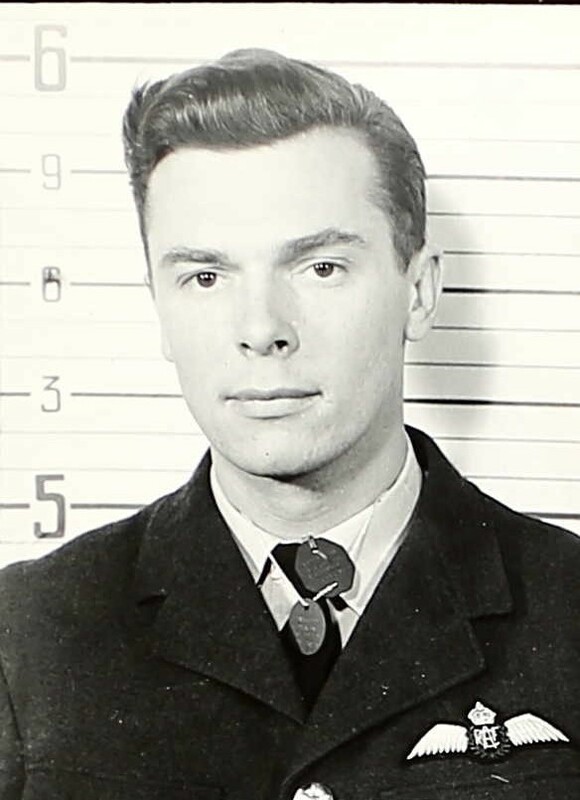 Tragically Cecil Hopton’s body was not accounted for or officially identified at the time – his remains had possibly not been recovered from the aircraft. After the war the leader of the local resistance and village Mayor, M. Rene Rouselle, confirmed that ND577 had been shot down by an enemy fighter and that all the occupants of the bomber had perished, their bodies being badly mutilated in the attack and burned as the aircraft had caught fire and crashed. M. Rouselle thought that the remains of six crew members had been recovered from the wreckage and as the fuselage had been well embedded in the ground due to the impact of the crash and had burned for several hours, the pilot’s body was unlikely to have been recovered. I have just received your letter asking information about what happened that night. The 8th of June an imposing bomber squadron soared above the village. It returned at 2.30 in the night. Several bombers were attacked by German planes above the village. The plane in question was attacked above the east end of the village of Les Menuls. I believe the crew must have been injured as the airmen made no reply, and the plane crashed in the forest about two miles outside the village. About thirty-three hours later, knowing that the Germans had not buried the members of the crew, I went to the scene of the crash and I found a German sentry there. I asked him ”who will bury the British Airmen?” and he said ”you, if you please”. Two hours later I returned with several young men. We found a great quantity of wreckage and I believe there were six men in the crew. If this information is any consolation and can soothe your great sorrow, I can say that he had no time to realise what had happened when his plane crashed and he was killed without any pain. We placed the remains of the crew on two biers and carried them to the chapel of our church where they were set up by the young men of our village. On the following Sunday, we had a funeral service. We gave to this ceremony all solemnity that was possible for we must honour our allies and at the same time our true feelings are displayed to the Germans. More than six hundred people were assembled around the biers, which were blessed by the village Catholic Priest. The grave was completely covered with flowers. Since that day the grave is kept in good order by the inhabitants of the village. On the eleventh of November during a ceremony for all allied soldiers who died for liberty, full military honours were given by a Canadian detachment, an American one and also the local F.F.O group. I still have a few things, a ring, two cigarette cases. If any day you will take leave for Paris, I cordially invite you to call here and see me. I shall take you to the Church-yard and to the place where the plane crashed. Perhaps you will find something that belongs to your boy. I remain at your disposal for all information you may require of me. Cecil Hopton was the son of a British emigree to Canada – his mother Mary was born in Yorkshire, England. Despite flying operations for a full year S/Ldr Hopton was not yet due any home leave, much to his parents’, especially his mother’s distress. This was the plight of many RCAF airmen, including 405 Squadron’s F/O Doug Hackett DFC – they never returned home. Note: F/Lt Richard Basil Leigh DFC had been Hopton’s navigator throughout their operational flying until the Orleans sortie of 19th May 1944. For the following two ops – Longues on 5th June and Versailles on 7th, Richard Leigh was replaced by F/Lt Conlon DFC. Richard Basil Leigh passed away on 13th December 2005, and in accordance with his wishes was laid to rest alongside his crew-mates (for 46 or so operations) in Les Menuls cemetery. ← ww2 RAF Bomber Command – 30th January 1944 – target marking 405 (Vancouver) Squadron RCAF. so sorry for the over long delay in replying – I’ve been researching loads more stuff about 30th January 1944 crew losses, more on featured crews, there is so much to highlight! All remarkable young blokes who gave up their normal lives to serve us all.